The Taxman Must Die is a wacky mix of an office comedy and a police thriller. 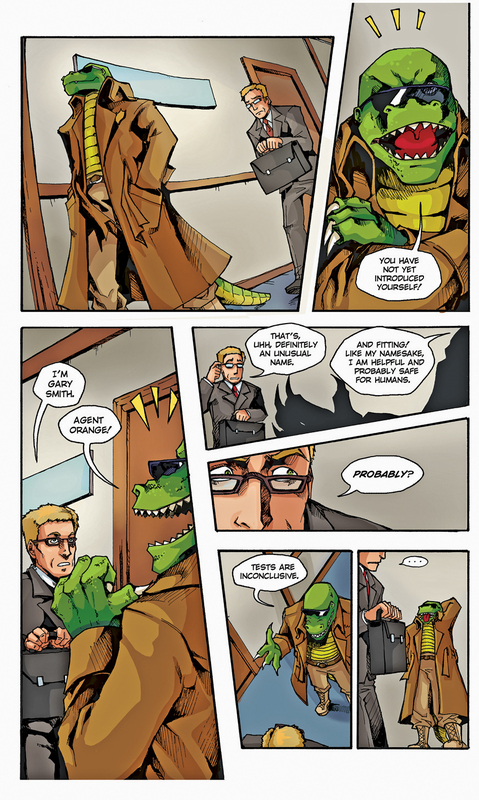 Two unlikely investigators –an accountant and a mutant alligator–have to save the world. From themselves, mostly. 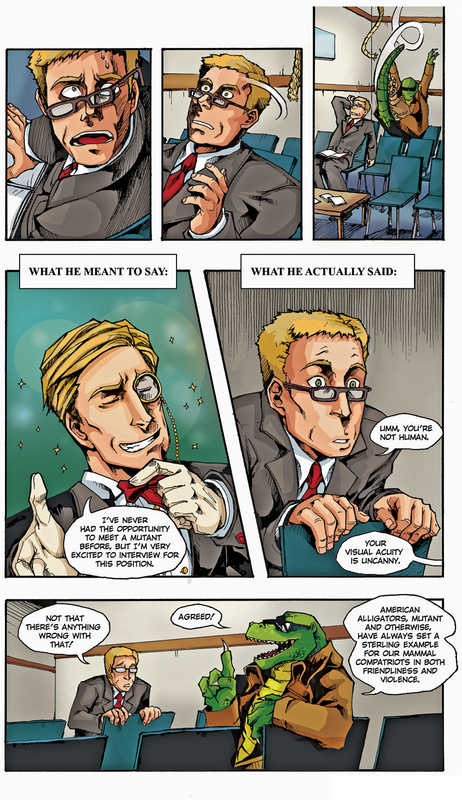 Here’s the scene where the two main characters first meet! If you like the pages, please sign up for the raffle for a chance to win a free, signed copy when it comes out. As always, if you’re interested in the story, please sign up for the raffle and you may win a free signed copy when it eventually comes out. (The more people sign up, the easier it will be for me to show publishers that many readers are interested in the story). Okay, here’s the short version of the coloring problem we were facing. Emily and I were working in CYMK Colors, the default coloring system of Photoshop. However, the web applications I work with prefer RGB coloring. Uploading CYMK works distorted the colors when viewed online, causing radioactive monstrosities like I linked to before. The solution was extremely simple. In Photoshop, go to Image -> Mode -> RGB Color. 20 seconds. However, publishers prefer CYMK colors because that works better for printers. Looks amazing, guys, great job. Top 97% of submissions for your given week, I betcha! Thanks. Please feel free to sign up for the raffle if you have not already. This was great. Really dig the art and the dynamic between these two is hilarious. Thanks. I’ll let you know when it comes out. Excellent job B.mac! Very professional and hilarious to boot. What font are you using in “The Taxman Must Die”? I didn’t do the lettering, sorry. …I know you’ve posted the answer to this somewhere, but I just can’t find it. When do you think “The Taxman Must Die” will be published (or finished)? Saw that you’ve gotten further on the anthology, love the cover by the way. DVS, I don’t really know. I think that’s mainly a question of how quickly a publisher says yes. PHASE 1: Revise, submit, revise and resubmit until a publisher says yes. PHASE 2: After a publisher is interested, I think we’d have the first issue on shelves within 6-12 months. 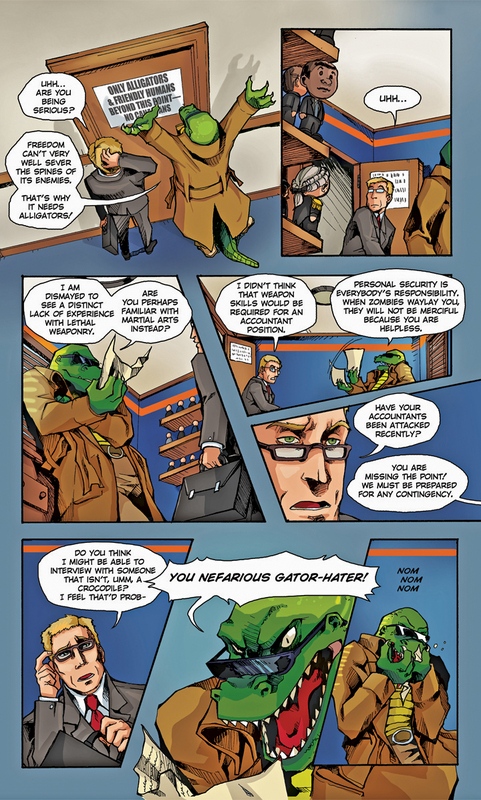 As I was reading this, I kept expecting the Alligator to say “MURICA” or something like that. 😛 I loved all the humor, and I’m pretty excited about reading the full thing when it’s published! “I loved all the humor, and I’m pretty excited about reading the full thing when it’s published!” Thanks! You can sign up for the email list/raffle here–I’ll send out an email reminder when it’s ready for purchase (and one person on the list will win a free signed copy). Once I saw another page of your comic book while going through your articles. I think the page showed a car explosion. But the artwork of these pages is significantly better than that of that single page. “But the artwork of these pages is significantly better…” Thanks! This artwork was executed by two different artists, Rebecca (pencils and inks) and Emily (colors). The mockup of the car-bombing was done by a different artist in a different style. 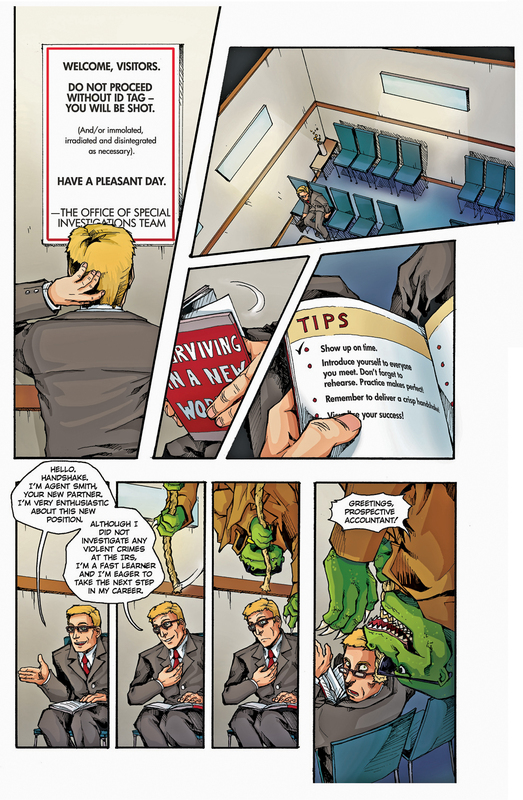 why did you choose to draw comic rather than write? *chose=.= Is drawing comics easier than writing? “why did you choose to draw comics rather than write?” Pardon? I wrote these pages, but did not illustrate them. I am not an illustrator. “Is drawing comics easier than writing?” Reaching professional-grade in either will take years of practice and I’d only recommend either if the prospect of spending thousands of hours on it sounds manageable. That said, my mostly uninformed impression is that it’s easier to find work as an artist (in part because publishers can evaluate prospective artists more easily than writers).